The day started out with an adventure just at the western outskirts of town. Near our hotel, we ran into the German couple, Joachim and Fina that we had met near Roncesvalles. As we crossed the main street heading west, a car veered off the road and appeared to be coming right at us. Fina did not see it, so I grabbed her backpack and pulled her out of the way. She was startled but thanked me profusely. As it turned out, the driver was only pulling into a driveway that was on our left and as he did so, he indicated that he was somewhat irritated that we were in his way. It became apparent that pedestrians did not have the right of way in this part of the world. I remembered that the Brierley guide book continually reminded folks that it was dangerous near the roads, and now I had first-hand knowledge. Before we reached Tosantos, we came upon a pilgrim couple that was travelling with their two children and riding donkeys. This made for some unique pictures. The first part of the day involved a gradual climb through hilly farmland for about 7 miles until we reached the village of Villafranca Montes de Oca. It was here that Greg and I stopped for lunch in a small café and then found at the west end of town a good place to rest and air out our feet and changed our socks to prepare for the long climb to follow. As usual, Greg was well ahead of me within a few minutes and I struggled up a very steep path where I encountered two bicyclists who were carrying their road bikes on their shoulders. They were breathing hard and sweating profusely at this arduous task. I made a lame joke about not riding up the hill, and they just stared at me and mounted their bikes at the top of the incline and rode away to join a downhill path that led to the N-120 a short way below us. 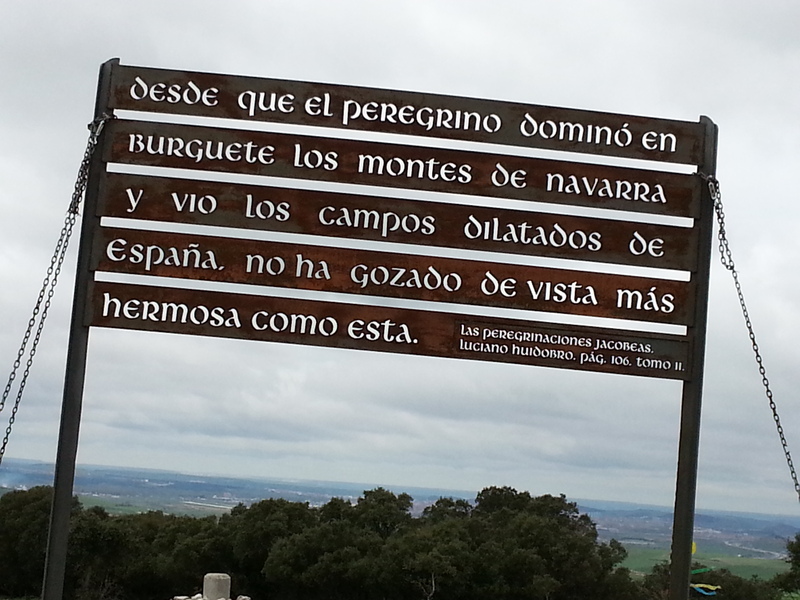 I kept moving up the hill to reach the Mojapan rest stop and then further up to the Monumento a los Caidos, a stark monument to the fallen fighters during the Spanish Civil War. For over an hour now I had been walking completely alone. Proceeding upwards, I eventually reached a flat spot and passed through a solitary stretch of wide path that appeared to be cut like a fire road. On either side there were foreboding black pine forests that were so thick, I could only see about fifty feet in before it receded into total darkness. The day was stretching on now, and the solitude was beginning to have an effect on me. By this time the clouds had come in and the temperature had dropped by 15 degrees at least. With each turn in the trail, I thought I might be finally beginning the descent into San Juan, but indeed another uphill hike presented itself. 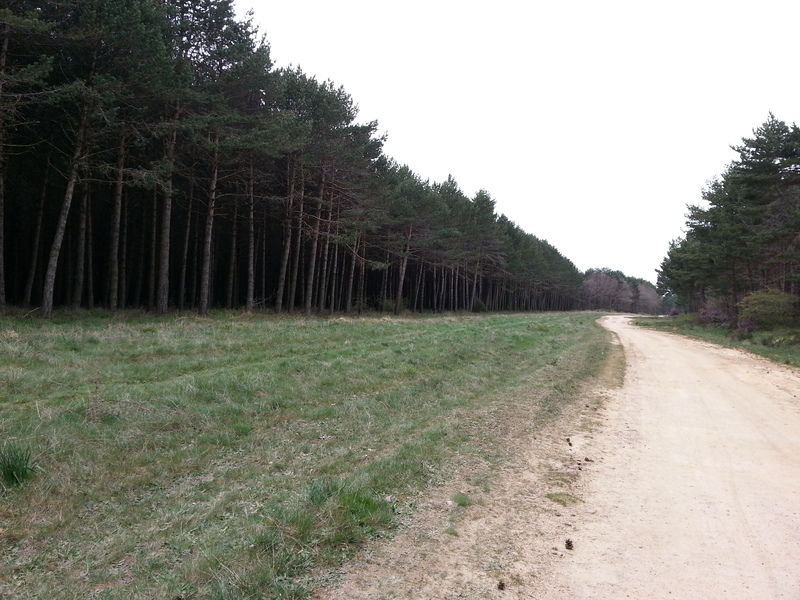 It was now over two hours of this lonely trek, seeing no other person. It then occurred to me that I had not seen a trail marker in quite some time either. Fear began to enter my consciousness. Had I taken a wrong turn somewhere? Was this why I had seen no one for this long period of time? After a while, the trail narrowed a bit and I looked down for some reason to see a small black adder making its way across to the other side. 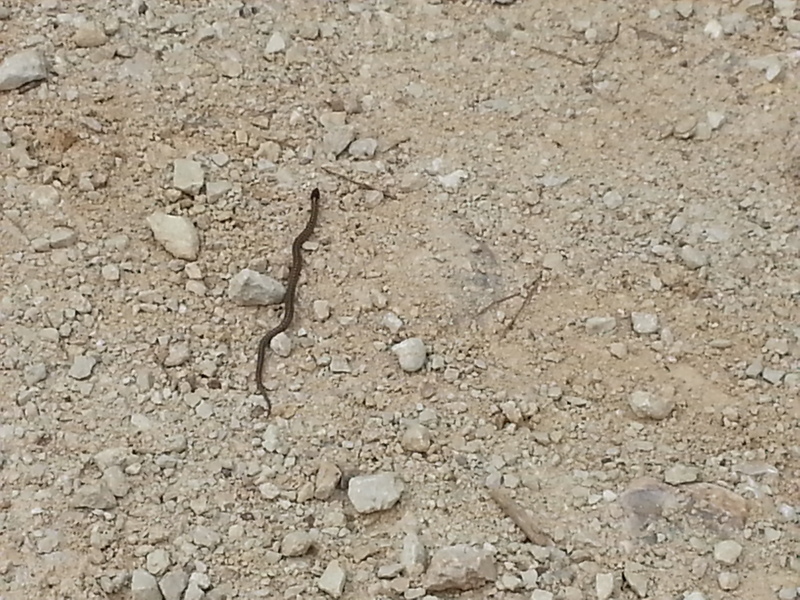 I grabbed my smart phone, pressed the camera icon, chased the adder until I could get a good picture, and snapped. Greg and I had been warned about indigenous poisonous snakes before we left, but up until this time had not seen any. The adder slithered away into the grass at the edge of the trail, and I secured my phone in my pants pocket. Within a hundred yards, the trail went through a clearing and opened up to a long downhill that crossed a small brook. After that I could see that it went sharply up again. Ahead of me I could see a biker joining the trail after the brook and then stopping about half way up the next hill at an object at the side of the trail. As I continued down, the biker moved away from the object and disappeared over the hill. I wondered what the object might be. I looked as if it might be an abandoned sleeping bag. As I got closer, the object got clearer and it was now obvious that this was a person lying at the side of the trail. Within a minute or so, I could see that the person was indeed Greg! He was just lying there resting. I suggested that he might not want to be lying on the ground after he saw what I was going to show him. From this point we were only forty minutes or so from San Juan. The wind was picking up once again and it looked as if it would rain any minute. 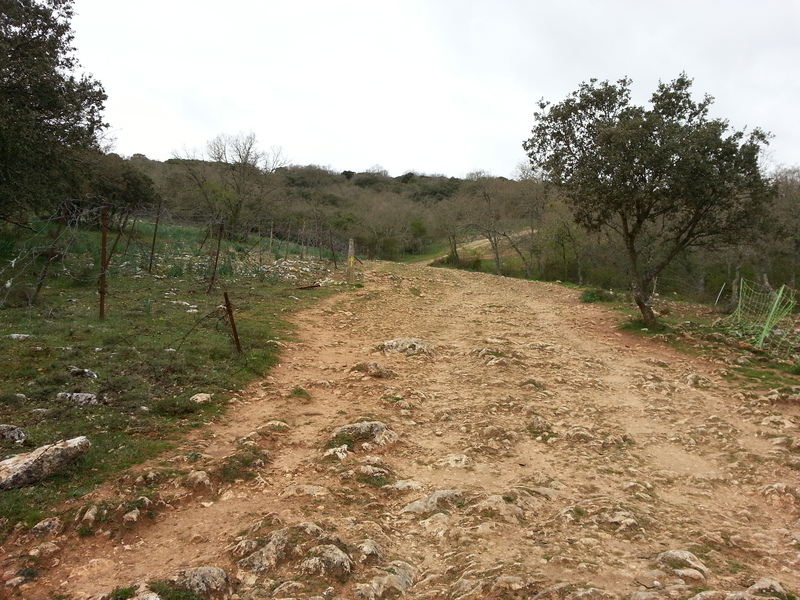 There was a steep descent into San Juan de Ortega. Once there, we found that there was one hotel, one bar and one alberque in the tiny village with a population of 30. We would later discover that these establishments were all owned by the same family. We found the La Henera Hotel easily at the entrance to town, and there on the front door was a posted sign that stated that we had to go to the Bar Marcela to check in. We walked the hundred meters to the bar and where we were given a key to the front door and our room. While Greg was in the shower, there was a knock at the door and there stood a man with two plastic bags. He gave them to me and said only: “Breakfast, senor”. We soon found out there was no WiFi in the hotel or anywhere in town for that matter. There was however a bus stop across from Bar Marcela and next to that was an “internet café”. This was actually two ancient computers in a hut alongside the road. For €2 we could get online for 5 minutes. Greg joked that the PC looked like a Commodore 64, and it nearly was this old. I used Greg’s Facebook account and messaged that we had arrived safely and were incommunicado for the rest of the day. The Bar Marcela was beginning to serve meals, but it was so crowded because of the attached alberque occupants that the wait was going to be long. This did not seem to phase the occupants stuffed into the bar who were well into their third or fourth round already. We decided to go back to our room and wound up eating some of our breakfast provisions for the next day. 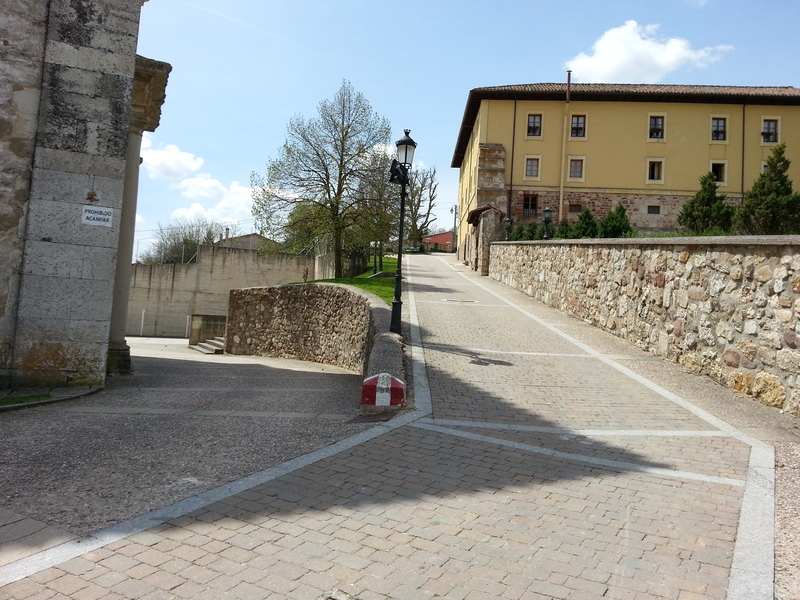 We knew, from our notes, that the next day would be a tough trek into Burgos, and we definitely needed the rest.